Kieron Salter’s name crops up on these pages fairly regularly: he and Teena Gade were at the NEC on Thursday, and were keen to discuss their new ‘KWM Consulting’ project. KWM is the company founded by Salter and Will Phillips, after the collapse of Reynard in 2002. One of KWM’s current projects is the conversion of the Creation DBA into a hybrid – an image of this revised car (actually the wind tunnel model) appearing in the latest LMES Annual (with a caption which suggests that the image appeared in error). KWM Consulting will provide potential clients with a network of independent consulting engineers and motorsport professionals for individual or collaborative project work under the umbrella of the expanding KWM brand. In addition to providing independent services, the network of consultants can be pooled to create a project team that can be utilized to deliver larger projects or jobs with short lead times. The technology and security now available from the advances in global high speed communications and the low overheads of the 'virtual office' allow this kind of consultancy to operate seamlessly and transparently as an 'on-demand' service. Race & Design Engineer Adam Schaechter. “We intend to expand the number of engineers and range of services available through KWM Consulting as the demand for a professional and reliable cost effective service increases," explains Salter. The team's work isn't just confined to sports prototypes: the individuals concerned are experienced in different classes of racing. 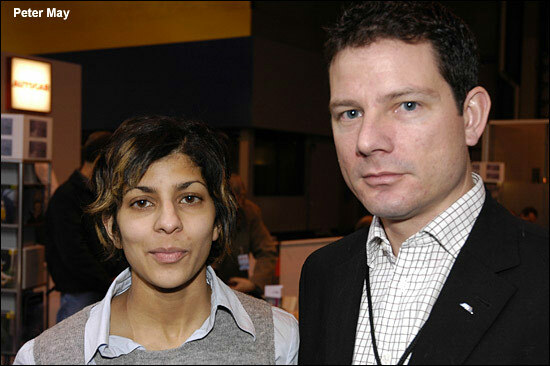 Teena Gade and Kieron Salter are pictured at the NEC on Thursday. Teena will be looking after Creation’s data logging again this year.